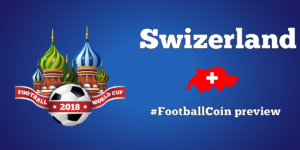 FootballCoin will permit for units of XFCCOIN (the game’s official currency) to be transferred from the Counterparty platform towards the FootballCoin game platform. This is a basic tutorial for how to transfer XFCCOIN and for the uses of the currency. Please be advised it is best not to transfer thee XFCCOIN from Counterparty to the game between 12/20/2017 – 12/21/2017 as work will be done on the website in concerns with the swap. Transactions made before or after this date should be unaffected. 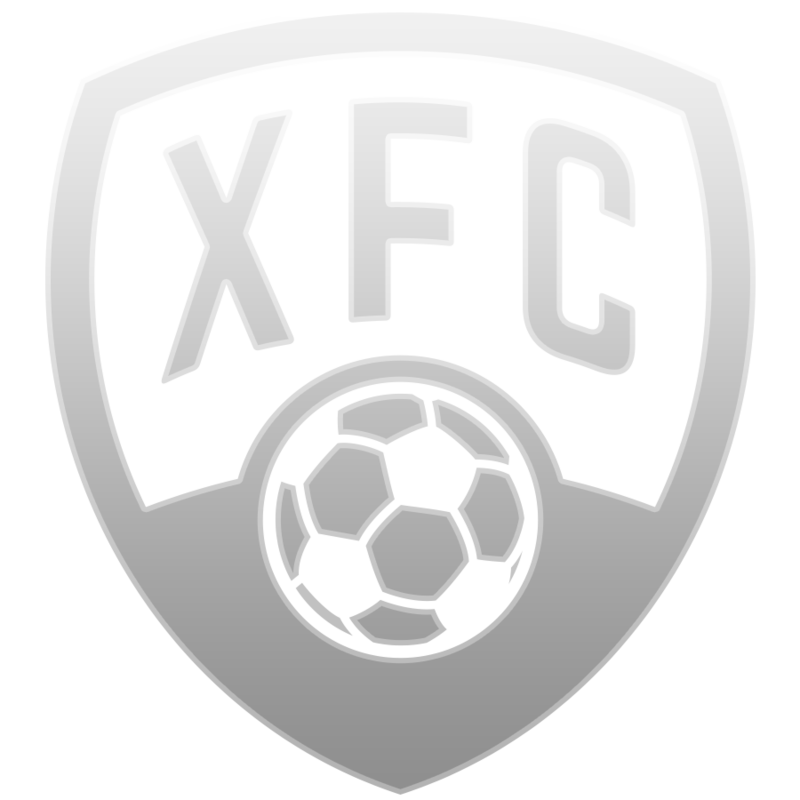 Many of our earliest FootballCoin users have chosen to store some of the XFCCOIN that they own inside the Counterparty platform. The Counterparty DEX platform has been used by FootballCoin for the trade of XFCCOIN during the period in which the team had made the decision to build its own blockchain. It was deemed that the speed, cost and ease of use were issues that needed to be resolved. 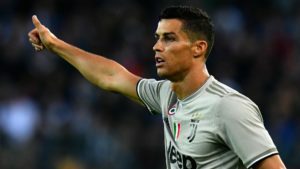 The FootballCoin team made the decision to develop its own blockchain. An exchange service and digital wallet were to follow. As the release of the FootballCoin blockchain (multichain) nears its completion, together with several projects that will improve the user experience inside the platform, owners of XFCCOIN may find it useful to have their amount transfer towards the game. They will then be able to use the amount inside the game, transfer it towards the official exchange, Digital Tokens, or transfer it towards the FootballCoin wallet to ensure it is safely stored. 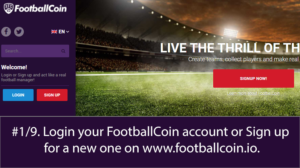 The first thing that you need to do is ensure that your FootballCoin account is properly set up. If you do not yet have an account, you will first need to register. Visit the link here to get started. If you already have an account, simply log in. Once inside the account, you will be able to see the total balance of XFCCOIN currently available. The benefit of having the currency directly inside the game is that you will be able to use it for actions inside the platform (buying/selling cards, joining contests that have an entry fee etc.). When you are logged inside the game, you will need the information to link the Counterparty account to the game. You will need to visit the Contests menu. Then you will click on the Wallet menu and visit the information located inside Contests. You will then be required to transfer the assets from Counterparty towards the FootballCoin account. For this, you will need to create a link, using the address from the game, between the two locations. !!! ATTENTION. Please carefully follow the next steps. If you encounter any issues, please contact the FootballCoin support prior to moving the XFC !!!! Before sending the XFC please make sure that you have all the information needed for this. Please review the following information prior to doing this. Please verify your Counterparty address and make sure that it is linked to your FootballCoin game account. 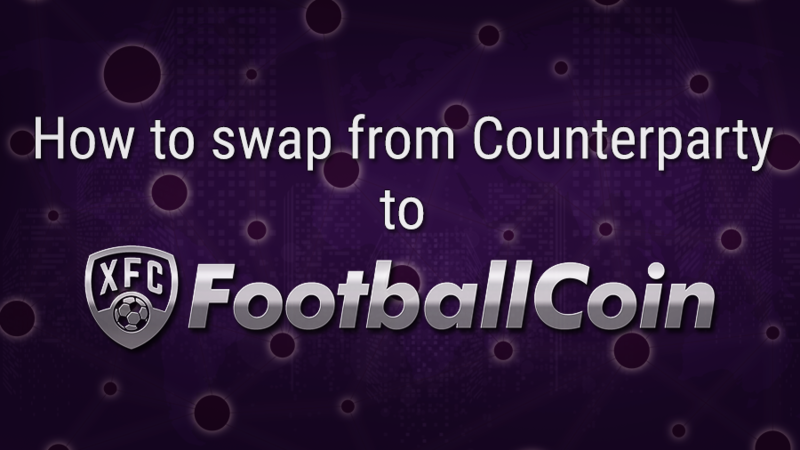 In order to benefit from the Swap, the XFC amount will need to show inside the FootballCoin game. 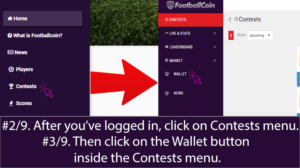 Once inside the game, you will be able to move them towards the exchange (DigitalTokens.io), the FootballCoin wallet (can be downloaded from www.xfccoin.io), or to leave them inside the game. 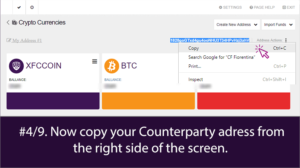 Once in the Counterparty platform, you will need to copy the address from the right side of the screen, above the balance showing you the available funds. You will then move back to the game and input the address information. This will create the link we previously mentioned. By doing this, you will then be able to send the coins to the game location. 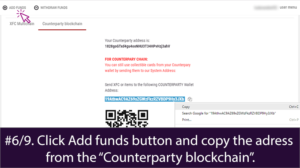 You will need to copy the Counterparty address in order to Add funds. 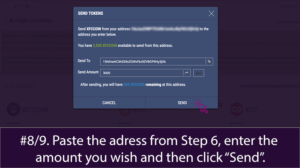 Once you have copied the address you will be ready to transfer the XFCCOIN amount towards the game. 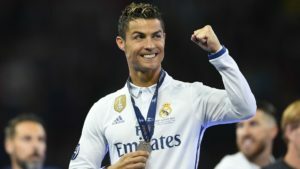 FootballCoin has created its own exchange service, Digital Tokens. It’s a way for our users to easily trade XFCCOIN at high speeds and low transaction costs. It is also a way to ensure that, no matter the development regarding XFCCOIN being listed on other exchange services, our users will be afforded this safety net. 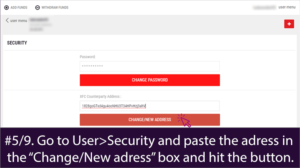 In this step, you will need to input (paste) the password we mentioned previously.Then, simply click on the “Send” button. 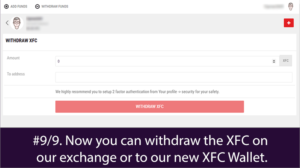 If you would simply like to keep your XFCCOIN for safe keeping, perhaps the best method is to store them inside the XFCCCOIN Wallet. You will move your coins from the game, or the exchange, and into the wallet. Here, you cryptocurrency will benefit from a high level of security. Ensure that you set up a strong password and that you have saved. In this way you will be able to access to your wallet at any time. Once the XFCCOIN is inside the the game, you are able to either keep it there, or move it towards the wallet or exchange service. 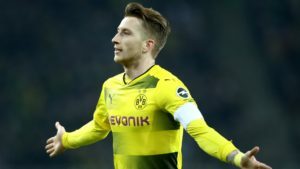 Is the Schurrle, Reus and Gotze partnership made to last for Dortmund ?